Put all of the ingredients in a blender. Add the pineapple juice last. Start with just a little. If you need more sweetness in your life, add more. If you have a mack-daddy blender, blending it up should take no time. If you have a cheapy blender (like me), then you might need to help it out a bit. It has a creamy texture and is very tasty! And you can't taste the spinach at all! It looks so healthy, is it tasty, too? I'm thinking of trying it over the weekend! It looks refreshing! We are debating about purchasing a Magic Bullet for smoothies. We have a good blender, but a pain to haul out and clean everyday. I'm so ready for a glass of this right now for breakfast! Sounds pretty good, I'm intrigued by the addition of avocado, I think that would improve the smoothie texture. Must try soon! It's a pretty shade of green!! Looks and sounds delish! I love smoothies :) I will for sure give this one a try. 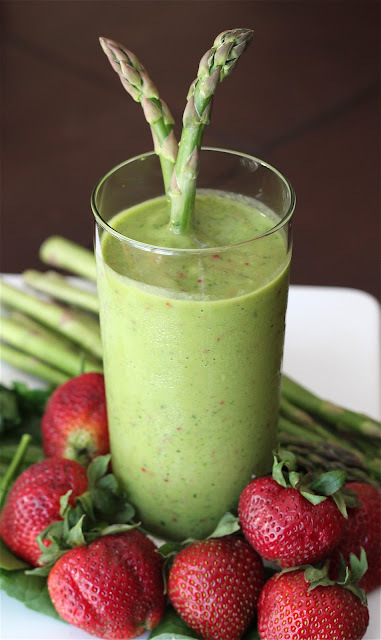 I usually blend spinach, mangos and skim milk but this recipe looks so yummy! Thanks for sharing. We've been trying to drink more green 'monster' smoothies at our home. Mango and avacado go great together, I used to make it for my babies. Thx for the smoothie recipe, love the ing. This sounds delicious and is not above my skill level - woohoo! Can't wait to try it.